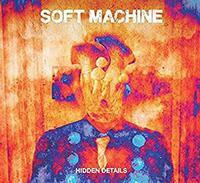 This is the brand new album from Soft Machine. A group with a long history, the current lineup is John Etheridge, Theo Travis, Roy Babbington and John Marshall. This album really lives up to what you expect from Soft Machine. There is a lot of jazz in the mix here, but it's prog-based and very intriguing. There is a good mix of louder and mellower sounds, more mainstream and stranger things. All in all, this is an excellent addition to the Soft Machine catalog. A distorted guitar opens this with almost a blues rock meets King Crimson vibe. That holds it for a short time, but as the other instruments join we get definite jazz elements built into the mix. This drives forward with jazz prog style and class. This is a real powerhouse, working its way through various shifts and changes along the road. I love the killer guitar soloing on this, but you can't overlook the bass work that holds things down in style, either. The cut gets quite intense before it's done. Killer fusion prog opens with the cut growing upward from the start. There are some definite space rock elements at play at times here. I really dig a lot of the grooves and changes on this cut a lot. It brings a different flavor to the table than the original did, while still maintaining a consistency at the same time. Weird echoey space textures begin this. It gradually begins to build calling to mind the spacey side of early King Crimson. That sort of element remains as this grinds through some killer jamming and gets much more intense. Acoustic guitar opens this and holds it for a time. The cut remains mellow as a saxophone weaves melody over the top. There is a sad jazzy beauty to this number. It rises up just a little, remaining understated. It seems like an introduction to the next piece in some ways. Feeling a bit like a continuation of the previous cut, electric guitar brings this into being with a bit of a bluesy texture. The cut continues in a slow progression that's packed with emotion and oozing cool. It's still fairly mellow despite the electric guitar. A rather stripped down and tentative piece, this has a lot of percussion with only hints of other stuff in the form of echoey space sounds. A rocking guitar opens this with a cool riff. This is another that has a lot of blues rock at its core. Still, they bring the jazz elements to play, too. This thing really works through some cool territory along its musical road. It's one of the most instantly accessible things here. It's also one of my favorites. Mellow keyboard textures make up the basis for this piece. It grows outward feeling a bit like something Vangelis might do because of the keyboard basis to it. Powerhouse jazz jamming is display with this killer tune. It's high energy and so classy. A jazzy guitar based exploration is on the agenda here. It's a mellower and relatively short piece of music. A more horn based cut, this brings the jazz to bear with style. In fact, the opening portions are dominated by the horns. It grows outward from there after a time. This gets into some decidedly freeform weirdness as it continues. More melodic and rocking, this does a great job of blending the jazz and rock stylings to create an energetic and powerful piece of music. The percussion really creates some magic on this thing, but the whole tune is one of the highlights here. I love the bass line driving this number, too. The reinvention of the piece late is all class. Coming in mellower and tentative, this gradually builds upward. It never gets all that rocking or involved, instead retaining an almost world music atmosphere throughout.